Why Did Kate Winslet Name Her Baby Bear Blaze? Kate Winslet is no stranger to unusual names - but said she named her son Bear Blaze for sentimental reasons. 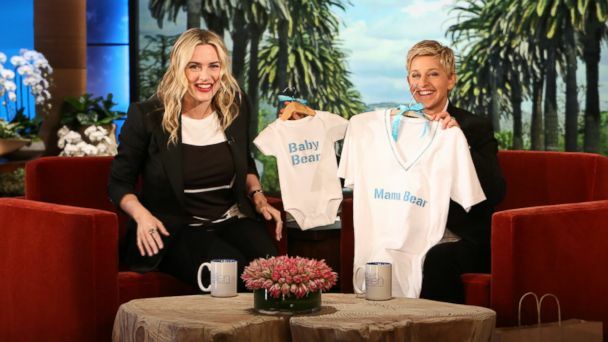 Making her first public appearance since the birth of her third child, now 14 weeks, Winslet told Ellen DeGeneres that she enlisted the help of her other two children, Joe, 10; and Mia, 13, when coming up with the name for their brother. "We settled on Bear quite early on," Winslet said. She explained that the name dated back to her childhood. "A friend of mine when I was younger was nicknamed Bear, and I had always really loved it," she told DeGeneres during an appearance on her show yesterday. "He was very much a Bear. He was everyone's shoulders to cry on. He was a big bear hug. He was just this great figure in my life, and I just always remembered him." Bear's middle name, Blaze, is a reference to the 2011 house fire where Winslet met Bear's father and her third husband, Ned Rocknroll, while on vacation in the Caribbean. "The house burned down and we survived," she said. "But we wanted something of the first, and so Blaze was the name we came up with." When DeGeneres asked why Bear's last name is Winslet and not Rocknroll, the 38-year-old actress shot her a look, "Why do you think, Ellen?" Before her appearance that morning, Winslet experienced her first-ever earthquake - while pumping breast milk. "I'm pumping, staring at my beautiful picture of my beautiful baby boy, and my husband's on the other line, and the room starts to shake," Winslet told DeGeneres. The Oscar winner and a friend took cover in a doorframe of the the hotel room, but Winslet never stopped pumping. "You know us girls, we just do it, don't we?" Winslet said. "When you do it, you just do it."